Man in military dress uniform stands in barracks at Rohwer concentration camp, Rohwer, Arkansas, 1942-1945. 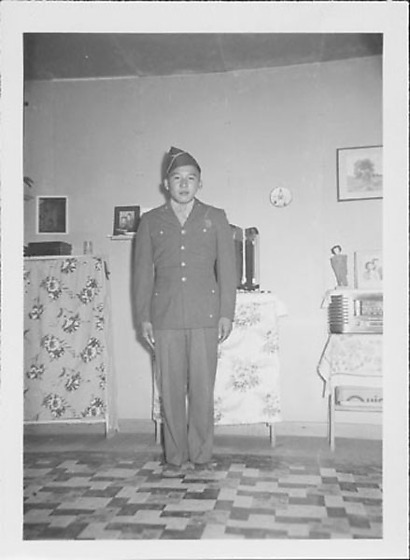 Dressed in dark jacket over light colored shirt and necktie, dark slacks and garrison cap, the soldier stands with arms at sides in front of three cloth covered shelves on variegated tile or linoleum floor. A marksman badge is pinned to his proper left breast. Portrait of couple rests on radio at left; mirror and another portrait of a couple in back, center. Same soldier as in 97.292.3N.